Eagle C.J. Smith is competing for a starting spot at cornerback. Out of 22 starting spots, there is just one position at which the Eagles have penciled in a starter who isn't having a decent camp so far. That would be the corner opposite Jalen Mills. Mills hasn't seemed bound for the Pro Bowl, but he has built on the aggressive, tough demeanor he showed as a seventh-round rookie in 2016. He looks like what we expected in the summer of Year 2. The same goes, more or less, for Ron Brooks as the slot corner, coming off a torn quad, even if that position technically isn't one of the 22 starting roles. But the other corner spot, as everyone following the drama knows, is up for grabs, and it's hard not to wonder if management realized it would be quite this dicey, after free agency and the draft. Patrick Robinson, signed as a free agent, is the listed starter by default. 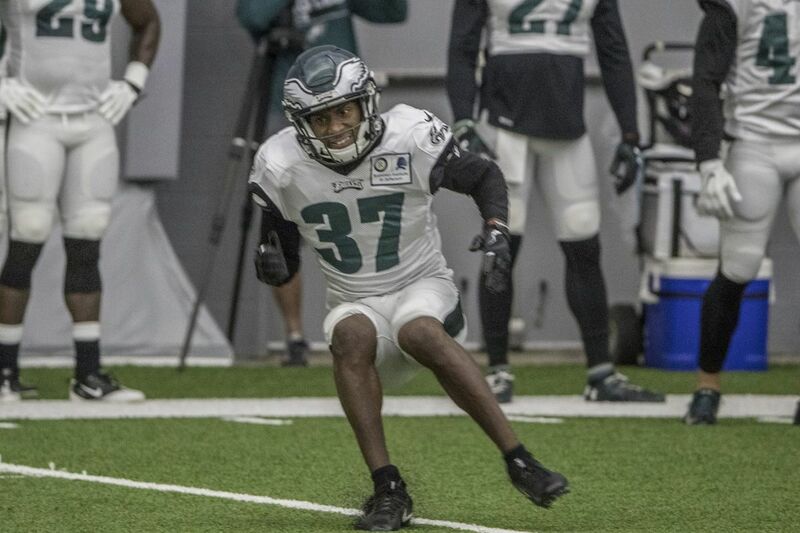 Robinson had a nice pick-six of Carson Wentz on Monday, jumping a sideline route, but he also lost some matchups and overall, has not had the kind of camp that would inspire confidence. Mills has been the best of a decidedly unimpressive bunch. The word you hear a lot when you talk to Eagles corners about their struggles is "consistency." Defensive coordinator Jim Schwartz talked about it Sunday, and also last Tuesday, his previous session with reporters. Lots of guys flash here and there. Nobody does it down after down. Ralph Waldo Emerson said that "a foolish consistency is the hobgoblin of little minds," but the guess here is that Ralph Waldo never had to watch helplessly from the sideline as his inexperienced corner made great plays on first and second down, then bit on a double move and gave up a long third-down catch. "When you play corners, if you make one mistake, it can be a touchdown, it can be a ball over your head. You can spoil three good plays in a row," Schwartz has noted. Out of Robinson, C.J. Smith, Rasul Douglas, Aaron Grymes and Mitchell White, the guy that puts the most plays together without a major mix-up during the upcoming preseason likely is going to be the Game 1 starter. That winnowing process starts Thursday night in Green Bay. If there is a contender who can establish the consistency needed to offset Robinson's advantage of seven years' experience, it just might be Smith, the second-year undrafted guy from North Dakota State. "Last year at this time, his head was swimming. He was coming from North Dakota State and everything was new to him," Schwartz said Sunday. "Now he's been able to work more on technique. He's been able to win matchups and things like that. He's an improved player from Year 1 to Year 2, and I think that's the sign that he's on the right track. "All rookies, all players are inconsistent, particularly young players, but he's been very assignment-sound, and when you can do that, then you can start working on the other things." In Monday's practice, Smith worked with the second team. He had one of the day's flashier plays, breaking in front of rookie wideout Mack Hollins and flicking away a pass Matt McGloin fired on a rollout to the right. "I saw Mack sit down, so I drove to him, the ball came, and I just knocked it down," Smith said. Hollins said the main thing he has noticed about the style Schwartz wants from his corners is that "they don't give up the inside often. It's hard to get in there." Smith said "just make plays and be consistent" is what he has to do to set himself apart. "And then, being comfortable and making plays." Smith made the team last year as a sort of novelty – "Turns out there's ANOTHER guy from North Dakota State, maybe he's here to keep Wentz from pining for Fargo." At 5-11, 189, with a 4.57-second pro day 40, Smith was neither real big nor real fast, but he was pretty savvy for a rookie, and he never came off as wide-eyed. Smith ended up playing in 10 games on special teams, as a gunner and a jammer on punts. "I didn't play on defense, but I got to watch a lot of football. I think that helped me," Smith said. "I was lucky enough to have sort of a redshirt year, and be able to grasp some things that I'm supposed to be able to do." Playing special teams under coordinator Dave Fipp helped his overall adjustment to the NFL mindset, Smith said. "He's so dedicated, he wants everybody to succeed, almost more than some of the guys themselves want to succeed," Smith said. "Last year, I didn't really understand how bad you should want it, until I saw him. Then I'm like, 'OK, I've got to match his intensity.' "
Asked what he thinks Schwartz wants in a corner, Smith said: "Not afraid to be challenged, be able to get up there in the guy's face, and to be able to make plays when they come your way. "Depending on the call, sometimes you have to play off, you have to give up the 5-yard hitch, and things like that, but being aggressive." This was not the defensive philosophy of the North Dakota State Bison, Smith said. "Kind of an adjustment. At North Dakota State, I didn't really take too many chances, I just made the plays that came my way," Smith said. "I think (Schwartz) is looking for a little bit more making some plays. Not forcing it, but just recognizing the play and being able to jump a route." Smith's challenge this summer is proving to everyone else what he says he discovered by the end of 2016. "I know I belong. Now I just have to prove it," Smith said.